I’m going to talk a little about my experience with creating my map for MER, soon to be released in late December, along with other methods of either creating or obtaining your map. And don’t worry, you absolutely do not have to be Michelangelo to create a map. I am no artist, believe me! Here is a step-by-step how I created mine. Once you’ve got something that you generally like as your footprint (the outline of the continent and maybe some general towns from you story etc…) then it is time to start adding lakes, castles, towns, villages, rivers, mountains, roads etc. Now this is where the tracing paper or vellum comes in. As you refer back to your story and start transferring landmarks to your map, you will need to make changes (more than likely, A LOT of them, LOL!) Like, “Wait! I need a castle here, and this river needs to move.” And instead if erasing your little heart out, place the tracing paper over your original drawing, copying what you like and changing what you don’t. This is tedious and, in my opinion, the least fun part. But the fun part is, as you do more and more drafts, your map will start to clean itself up and start to look more like a map! Then after adding what towns, castles, and rivers that are in your story, you will need to start filling in the dead space, otherwise your map might look a little barren. Make a list of names that you might like for your landmarks. Here is a list of Landmarks your map may have. Don’t limit yourself to this list (as I’ve probably forgotten some things LOL! ), but reach for the sky! This is your masterpiece, your creation, do with it what you want. There are no limits. This is fiction we are talking about here! Once you’ve finished matching the map to your story, filling in dead space, and naming all of your landmarks, it’s time to color in your map. If you only want black and white (which will be one-dimensional) you probably won’t want to color it, but if you want color or even grey scale, you will want to, to help differentiate water from land, etc. Now if you are an artist and feel that you have a masterpiece, by all means, use this as your map. I definitely couldn’t, Haha! You will just need to format it to size, according to your publishers guidelines, or have it formatted for you. There are many low-cost formatters out there on google. The one I used is April Martinez, mail@aprilgem.com. She formatted my book (and map image). Just e-mail an inquiry and she will send you back a list of prices. Now that you have your rough draft, you could always contact a Graphic Artist or Cartographer to have the drawing digitally and professionally rendered for you. This is what I did. And here it is again! Woo hoo! MER‘s Map of Merenia! I had no idea my book could have such an amazing map! Now I’m not going to pretend to know a lot about this, as I said earlier I’m computer illiterate when it comes to stuff like this. BUT I will tell you some software you may use if you would like to try it yourself. You will still want to do METHOD #1 and create a hand-drawn draft of your map. You can scan your map into Photoshop or Microsoft paint and digitally manipulate it to insert text (landmark names), do a cool watery effect, create mountains, city and castle symbols, etc… Here is a good blog post on doing your map via Photoshop http://www.brodt.dk/peter/maps.html. 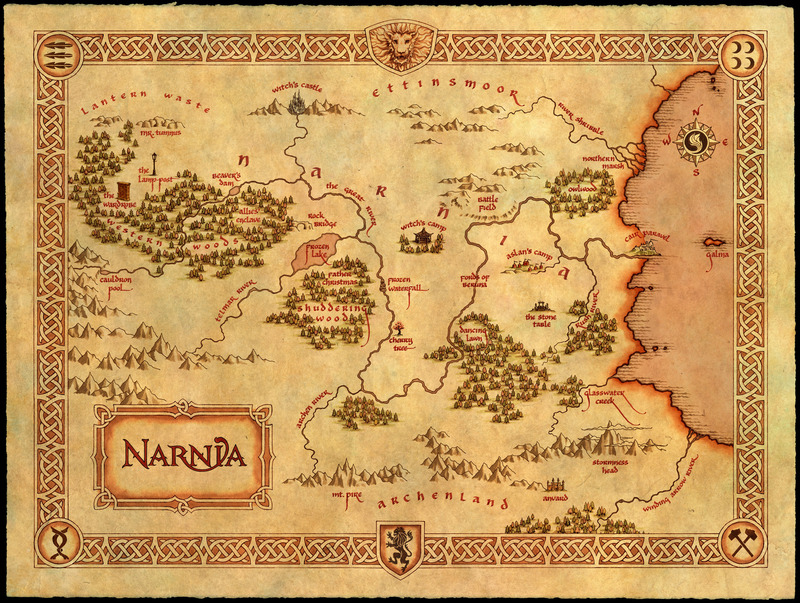 Now, after that information overload, let’s take a break and look at some well-known authors who used maps in their novels.It all started with the grandfather of fantasy maps/ fictional world development, Tolkien and his Lord of the Rings. This is the Map from The Hobbit, the prelude to the Lord of the Rings. As an author or author-to-be of a fantasy series, you more than likely will have one of these in your home library. If you don’t,which I would find hard to believe :D, I strongly urge you to get one and study it and its usage of maps. Thank you for reading about map creation with me today! I wish you lots of luck in your writing journeys. And don’t ever, ever give up! It can be overwhelming, especially if you are self-publishing, to put all of the pieces together by yourself. Just take a deep breath and keep on plugging on! Please leave a comment if you have any other helpful information on map creation for your novel. Or even if you don’t I’d love to hear from you! Please LIKE my book, MER on facebook here http://www.facebook.com/merbook1 to read cool snippets and get updated info on the book release! Thanks! And may the power of words be with you! Very fancy! Currently I scribble on an A4 pad with crayons. And I’m not kidding about the crayons. Haha C.A.! I’m telling you, crayons are the way to go! Awesome article – I’m most of the way through my first fantasy novel, and its been about eight months, and I was searching the web for a map-making tool or system, and I guess I will end up just sketching it myself and skipping the cartographer part. Im glad you liked the article. That’s quite a coincidence Gabe!As long as what you write isn’t better than what I write I totally don’t mind. Haha. No, really there is no rule book that says two books (or many for that matter,) can’t have similar scenarios and/or names and places. If that was the case, we wouldn’t have much of a selection of books! Just look at all of the vampire books out there, although different, I’m sure they have many similarities. And especially if it is something you’ve already written, as long as you’re comfortable with it and don’t think it will be too much of a conflict of interest. What is your book called by the way? Its a working title – The Shepherd’s Son, hopefully the first of a series. It won’t be an issue to change anything at this point. I realize that I don’t mention it more than five times in my writing, and the map is in progress. I noticed you said it took you about nine months to “finish” your novel; is that daily writing or when-you-have-the-time writing? As a full-time college student, I’m realizing that getting ten hours a week to write is a rare thing. I am in the same boat as you. I wrote it in a “when I have time” fashion. I own my own small business, and am the full time caregiver of my 2 kiddos (who are both under 5 and are home ALL the time!) Any scrap of writng time I find is precious. But I also would make sure I had at least 1-2 days a week where I scheduled myself free of work and a sitter for the kids. I would take advantage of those days and write all day long. It’s hard when you’re s busy bu makes it that much more rewarding when you pull through and finish! I wish yu the best of luck on your novel and feel free to holler if you have any questions. You can find my author page on facebook. I don’t have the link just with me but search Jade M. Phillips. Id be happy to help any time. Cheers! I just have to say… that attitude is so impressive and I can only strongly commend you for it (and it’s an idea that should be adopted)! I don’t think I’ve ever read or heard of someone like you there! Too many are controlling of names and concepts even if the name or concept derives from something else (which is usually the case for both names and concepts). That you would say you don’t mind that they have the same name (or abbreviation … or is it an acronym ? Not sure if you’re pronouncing it or not) is remarkable! This is still true even though it’s a coincidence; there are many who would have a problem with it. I dare say most would have a problem with it. But you don’t? If only more people and organisations were like you! Best of luck with your publishing (and success with your book[s]); I won’t be reading it and I only am interested in maps for not books (although I have plenty, mostly Tolkien [because I have the histories of Middle-earth] although of course I have The Chronicles of Narnia and a few others if not more than a few) but for a game I’m a long time designer (and programmer) for – with a very outdated map (that I did not draw). But I have a good friend who was at one point trying to get publishers to be interested in her books (but not fantasy based). Or put another way I have plenty of things to read (and always have, always will) but when I saw your attitude about the names I felt I needed to comment – and knowing that it’s difficult to be published I figure I would offer that luck too (especially given your wondrous attitude). Well, thank you Cody! What generous words! It is very much appreciated and, in turn, there should be more people out there like you who take the time to offer support and kindess. Thank you! You’re quite welcome, Jade! It’s nothing but the truth, though. This is something I’ve written about before: intellectual property is abused (the copyright system in general is e.g. the case where until recently the Happy Birthday song was copyrighted!) and I do not even refer to patent trolls (who are even worse). The reality is the things we have are all from things evolving, whether technology or something else; in the case of fantasy you have the father Tolkien but then you have many people inspired by him (and also his biggest fan perhaps besides – and maybe only on equals – his son Christopher, being of course C.S. Lewis, both part of the Inklings group: and Lewis is of course the author of The Chronicles of Narnia as well as other series). But what would the elves, dwarves (or as Tolkien put it the historically correct plural is dwarrow[s?] but he thought it too archaic though still wishing he had used it) and the other races we know and love today be without him? Maybe someone else would have made them but we can’t guarantee it. So which is it? Do we embrace what others have offered us in a respectable way, or do we try to make claims to something that we only partially created? Meanwhile you have a name and you’re not even trying to claim it! That shows great character! I personally feel it is important to express gratitude not only through words but by actions – and I do this. I will never ever take life for granted and that especially goes for lives not mine. Who would I be if I were to take another person for granted or to judge whether e.g. they should live or die? Many that do deserve death (define ‘deserve’) live long and vice versa but even the wise cannot foresee all ends (that’s somewhat of a reference to Gandalf but not exact words because my personal library is not the computer or server room). I’m not the one with the same name here but I still feel obligated to thank you for being the way you are. I really appreciate the kinds words (it’s something that is also more rare in this world, and I’m no stranger – although it was years ago – to mostly nastiness aimed at me because of ‘being different’) in return (see also part about thanking others) but I felt obligated to thank you for (see part about not taking things and other people for granted) such a wonderful attitude. Things could always be worse and for me personally they have been. It’s true they could be better but that goes for everyone. There are many people who have things much worse than me and I will never forget that. Equally so, there are many things I don’t have that I wouldn’t want! That is where my mindset is and I really wish more would see it that way (but I realise that isn’t going to change anything which is all the more reason for my initial message)! Once again, best of luck to you not only in the writing department but everything else, as well! I would follow you on Facebook and/or Twitter just to see what comes of it but I don’t use Facebook or any social media; but maybe I’ll come across it at some time in the future (hope so even if I don’t read it!). This is in the Letters of J.R.R. Tolkien as well as The Treason of Isengard (book VII of The History of Middle-earth, which is the book I’m currently reading the last part of). The part about suggesting it’d be better if more people had my attitude as above makes it more significant (to me) and so I appreciate more. *Great* advice and nice article. I also make maps for my stuff through my process is a bit different. It’s always handy to see how others go about doing it. I actually have a moleskine which consists only of map ideas I have sketched out. It’s a super handy starting point for me. Not to take away from the Cartographer’s guild but if you want to do some fantasy cartography on your own (and have the softward to do so) you should youtube search “zombie nirvana” and select the fantasy cartography option. Those online tutorials should give anyone a headstart on fantasy cartography. Hi Sam!I may have someone in mind. Go into my contacts page to get my email and send me a quick message. 🙂 We’ll try to arrange something. Hi, I really liked your article. I’m in the process of finishing , and getting ready to self- publish my first novel . Do you have any further advice you could give me? Can you send me an email? This is really cool! I’m 13 and have big ambitions, like making maps for a book series I’m writing and I think I’ll refer to this a lot from now on because I’ve created A LOT of maps and none are exactly what I’ve wanted, but I think this’ll help with that portion a lot. Thank you so much for this fantastic tips and information. This was exactly what i was worrying about. I need a map for my book, but i have no clue about how to make one. But now i do. Thank you! What a terrific post. Thank you! If you don’t mind. I’ll take that idea from you. I’m working on a big world for a series of books . But i don’t want to know hoe it ends yet. I’m almost done with my first draft and I’ve been working on a map. This post was a really big help, Thanks Jade! Amazing timing! I just spent most of my evening drawing out a map. The amazing thing is, once I had the map some vague idea I had been holding onto just fell into place and I proceeded to knock out 2000 words of really solid Material. Thank you, this article was AMAZINGLY helpful. I’ll be sure to recommend it to anyone wanting to make a map! Do not plaster mountains where ever you want. Mountains form in various regions for a reason: that reason is tectonic plates. Unless a mountain is magically generated (which is acceptable), don’t drop mountain ranges all over the place because it’s ‘where you want them’. Also, rivers run downhill, and from mountains. Oceans and seas do not feed rivers. I see too many aspiring map-makers and authors make these mistakes. Take a brief, five-minute look at how geography affects certain regions. I frequently see the same mistakes made with deserts. Thanks for that. I’m currently trying to improve my map for my current series. I self-published it with a rubbish map, but I now have a publisher and want to improve it. Your blog has helped me no end. I created a map myself for my fantasy novel, just drew it and plastered it on cardboard (for longevity). Now, halfway through the book, I have a friend who is willing to draw me the map professionally for free! It’s really awesome, and I’m super excited to see how it turns out. Hopefully the book will be just as good.